Graded FAIR 20 by SGC. Striking example of Hall of Famer Wilbert Robinson from the N142 Duke Cabinet series. There are only four baseball players in this set, which was issued in 1894 by Duke's Honest Tobacco. Each Duke cabinet measures 6 x 9-1/4 inches, making this set one of the largest and most impressive of all baseball-card issues. 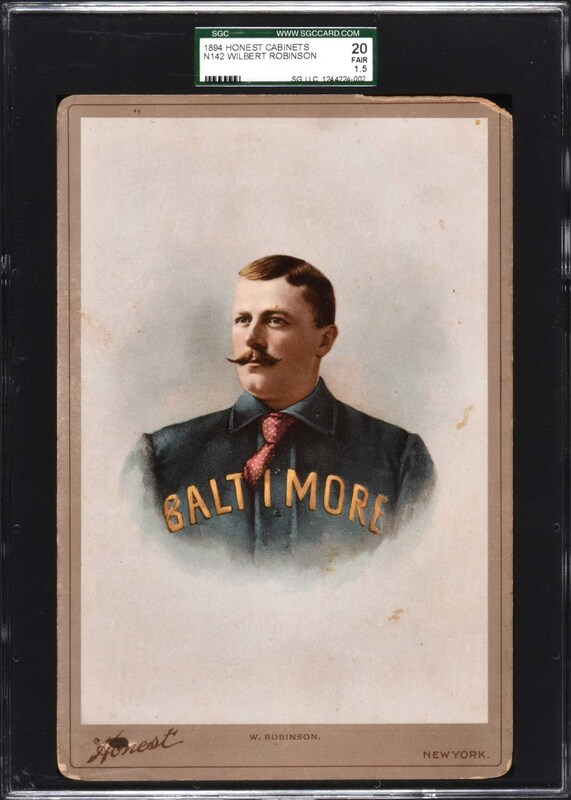 This a very attractive example of the Hall of Famer dating from his playing days as catcher for the legendary Baltimore Orioles of the 1890s. Robinson is naturally one of the highlights to the set, and is considered by many to be particularly rare. SGC has graded only four examples of Robinson to date (compared to seven of Nash, eight of Delehanty, and ten of Davis). 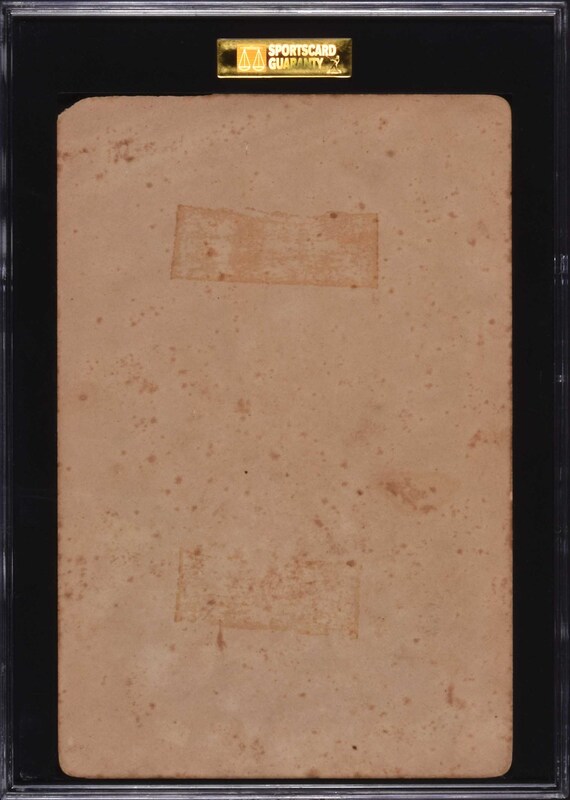 The cabinet has chipping along the top edge, some light spots of toning in the background, corner wear (including significant surface chipping in the upper right corner), and excessive staining on the blank reverse. Despite these condition problems, the card still displays very nicely. The condition problems do not affect the image of Robinson, which is bright and clean. There are very few cards of Robinson, as his career spanned the years 1886 to 1902. Since the earliest days of organized collecting, Duke cabinets have always been revered by collectors. Even in the 1930s, Jefferson Burdick assigned them a value of $5 each, making them the highest-priced baseball-card issue in the entire American Card Catalog. This was back when the T206 Wagner listed for $50. Because they are so rarely seen, they get very little attention. Yet, by any criteria, Duke cabinets are one of nineteenth-century baseball-card collecting's premier issues. Duke cabinets, which advertise Duke's popular Honest tobacco brand in the lower left, are one of the very few pre-1900 baseball issues and the only baseball cabinet series of its era which is printed in color. This one of the rarest and most beautiful of all Wilbert Robinson cards. Reserve $1,000. Estimate $2,500+.